If you talk to most content marketers about their work, they’ll talk about it like they’re living in a scene from Field of Dreams. But I’m here to tell you: if you build it, they won’t (necessarily) come. That’s a myth of modern content marketing. Even so, I believe in content marketing. I wrote a whole book about it, produce a podcast about it, and speak about it all over the world. That’s why I want content marketing to work for you. More than that, I want it to work for you better than it ever has in the past. And to do that, you have to understand the truth of content marketing: You can’t just build it. You need to research it, find an audience for it, build it, then promote it. Then, they’ll come. They’ll read. They’ll click. 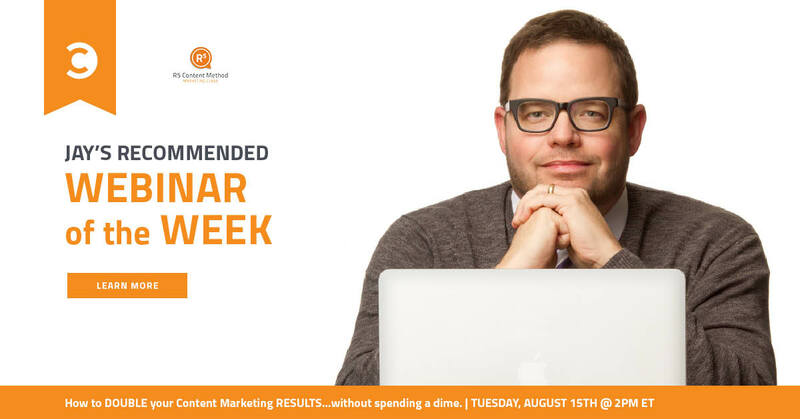 Join me on Tuesday, August 15, at 11:00 am PT / 2:00 pm ET, to learn how to double your content marketing results without breaking the bank by using my R5 Content Marketing Method. It’s based on my work with the world’s largest brands, and my team and I took these lessons and modified them for small and medium sized businesses. Plus, if you’re one of the first people to sign up for the webinar, I’ll also send you a copy of my brand-new, not-yet-released ebook: Four Ways to Fix Your Broken Content Marketing: the Thoughtful Marketers’ Manual. What are you waiting for? It’s all free (and free stuff rules!). According to a research report from Buzzsumo and Moz, in a randomly selected sample of 100,000 posts, over 50 percent had two or fewer Facebook interactions, and over 75 percent had zero external links. No wonder content marketers want to pull their hair out—for the vast majority, nobody is interacting with their stuff. Whether it’s because the content is poorly put together or because it’s simply poorly amplified, too much of marketers’ hard work is just sitting on the internet collecting dust. Effective content marketing is about the wants, needs, and interests of the person reading it. So, how can your content be relevant to them if you can’t provide answers to those needs? One of the problems (if not the biggest problem) most content marketers face is they don’t know their audience intimately. Sure, you might have an idea, the same way I have an idea that Daenerys Targaryen is the savior of Westeros, but you need data to back up your anecdotal evidence. You have more resources at your fingertips than you realize for collecting data about your audience. Start by talking to your team: What has sales learned about their prospects? What do they think your audience’s biggest pain points are based on the conversations they’ve had? Who do they close deals with the most frequently? Their CRM data can help quantify their opinions. The same goes for your customer service team. They’ll have keen insights on who your happiest (and unhappiest) customers are and why. Then, go online to dig deeper. Your website, email, and social media analytics are goldmines for information about your target audiences, their demographics, geography, visitor behavior, and more. You can even purchase audience research from companies like Gartner and Forrester. You’ll soon find that you know too much about your audience (what a good problem to have, am I right?). Take everything you’ve collected and hone in on which pieces and parts are actually useful to you. Pay attention to large sweeping trends and also make notes of anomalies that could be caused by seasonal changes in your business, political events, or something else entirely. With your data collected and narrowed down into useful snapshots of your customers, you can make educated assumptions about your different audiences. Then, and only then, you can bring your audience to life through marketing personas. As we’ll learn from the webinar, once you understand exactly who your audience is and what they want, you can pick the right content topics that they’ll find irresistible, put them in places where they’ll actually be found, and measure your results. Register for How to Double Your Content Marketing Results right now to give your content strategy a much-needed makeover and become one of the rare content marketers that describes their efforts as extremely successful (only three percent do, FYI! ).